WHAT MAKES ACT ENERGY DRINKS SO GREAT? naturally generate super vitality, providing full-body revitalization. Feel more energized and focused! A unique blend of herbs, fruit extracts, vitamins & minerals provides fast acting ACT Energy results. ACT Energy Drinks are the world's first FEEL GOOD energy drink. How do ACT Energy Drinks work? Every cell in your body depends on energy to perform their respective functions. Most people eat foods high in calories and low in nutrients...the very nutrients cells need to perform. ACT Energy Drinks target metabolic pathways, to support energy at the cellular level. Energy-stimulating beverages have been around and growing since the 1980s in the U.S., but the trend started over-seas in Europe and Asia well before its induction into America. It's a market that much of the beverage industry is trying to tap into, and not always with the greatest success. During the 1980's in the the U.S., an extremly high-caffeine, high-sugar, cola brand was released. It targeted the same general, younger audience of professionals and students as the current energy drinks do today. It was the success of this cola that sparked the energy-craze we see today! By the 1990s, the first true "energy drink" was introduced to the U.S.-- the same brand that currently holds over 50% of the market even today. Energy Drinks have since evolved into multiple brands and narrowed target markets, and have even teamed up with some alcoholic beverages in an effort to claim a cure to hangovers. Still, most of the energy products that we see today contain more or less the same ingredients. Much of the hype lies in the marketing strategies, but is also lies heavily in the quality of the energy experience each product offers. The main ingredients of most energy drinks are simply high levels of caffeine and sugar, with several newer beverages offering as much as 300 mg of caffeine alone. That's about the amount of caffeine you would get if you were to drink four cups of coffee! 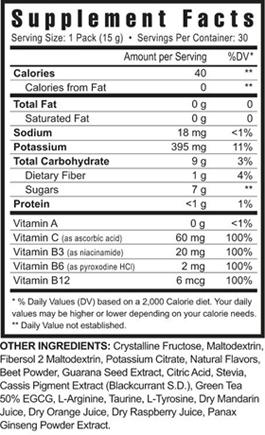 Now add in about 30 - 60 grams of sugar, and a few other herbal ingredients such as taurine, ginseng, and guarana. Unfortunately, it is the addition of these herbal ingredients that contribute to the common deception that energy drinks are good for you. But the temporary and superficial jolt of "energy" and the crash that follows suggest otherwise. So how can someone get the healthy energy boost that they need to make it through the events of a busy day, or to pull an all-nighter? 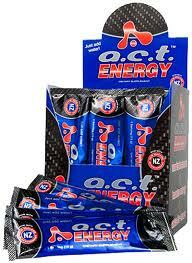 ACT Energy Drinks Online has targeted and formulated the Solution! Unlike other energy drinks that are dehydrating and tend to work against your body's natural functions and abilities, ACT Energy Drinks work with your body, resulting in optimal balance and performance.